Bakeries are a wonderful place, aren’t they? they smell so good. And, they have all of those yummy treats. Bourke Street Bakery is a well-known Australian bakery that has a reputation for having delicius treats. Because we can’t all be in Australia, a cookbook is the next best thing to being there. 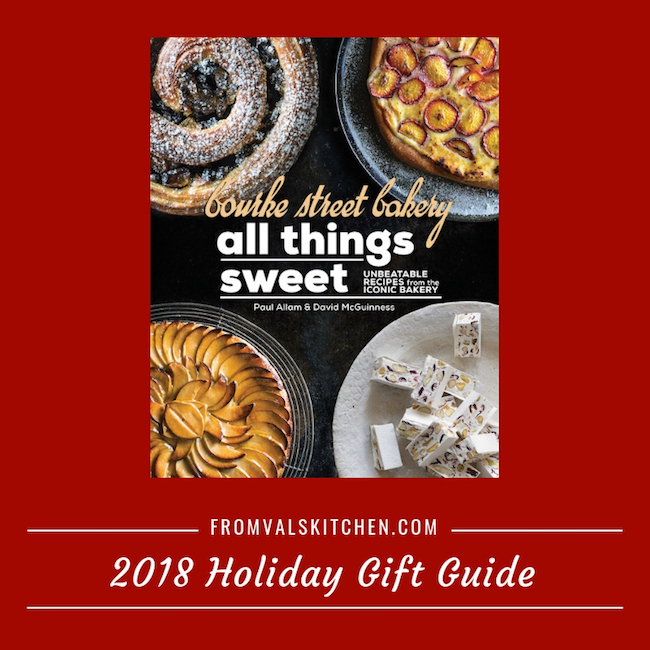 The Bourke Street Bakery: All Things Sweet would make a great gift for anyone who enjoys baked treats as well as folks that enjoy baking and entertaining in general. Anybody can find a recipe for brownies these days, but can you guarantee that it will use the best possible ingredients to make the chocolate brownies of your dreams? Paul Allam and David McGuinness’ Bourke Street Bakery: All Things Sweet is not just any cookbook, but the baking book you need on your kitchen shelf to create the most incredible pastries, cakes, tarts, cookies and confectionery imaginable. Representing years of testing, adapting and refining of the recipes, Bourke Street Bakery: All Things Sweet is comprised of ten chapters (Cakes and Muffins; Cookies and Biscuits; Sweets; Sweet Pastry Doughs; Tarts; Sweet, Sweet Pies; Puff Pastries; Choux Pastries; Croissant Pastries; Brioche and Sweet Breads) of delicious recipes that promise to deliver the very best results, using the very best ingredients. Whip up a Flourless Mocha and Hazelnut Cake for that charity bake sale and grab an Apple, Bran and Sour Cherry Muffin as you run out the door for breakfast. Impress your guests at your dinner party with Ginger brulee tarts and top off that Sunday lunch with Pain au chocolat bread and butter pudding. Complete the kid’s party table with Marshmallows and Rocky Road and get festive with Gingerbread men biscuits, Christmas fruit mince pies and Christmas cake. Complete with advice, tools, step-by-step photography and trouble-shooters, Bourke Street Bakery: All Things Sweet is the must-have comprehensive baking guide for every occasion. Paul Allam is a chef, baker and co-owner of the wildly popular Bourke Street Bakery empire. David McGuinness is a chef, baker and co-owner of the wildly popular Bourke Street Bakery empire. Paul and David opened the doors of their first bakery cafe in Sydney in 2004 and now have eleven Australian stores and a New York venture underway. Bourke Street is more than just a bakery – Paul and David are also founders of The Bread and Butter Project, Australia’s first social enterprise artisan bakery, training refugees in baking and pastry-making, and delivering handmade bread to stores around Sydney. You can learn more about these titles and others on the Quarto Murdoch Books website. You can also keep up with Quarto on social media, on Facebook, Twitter and YouTube. that some rhubarb plants can produce for as long as 20 years! 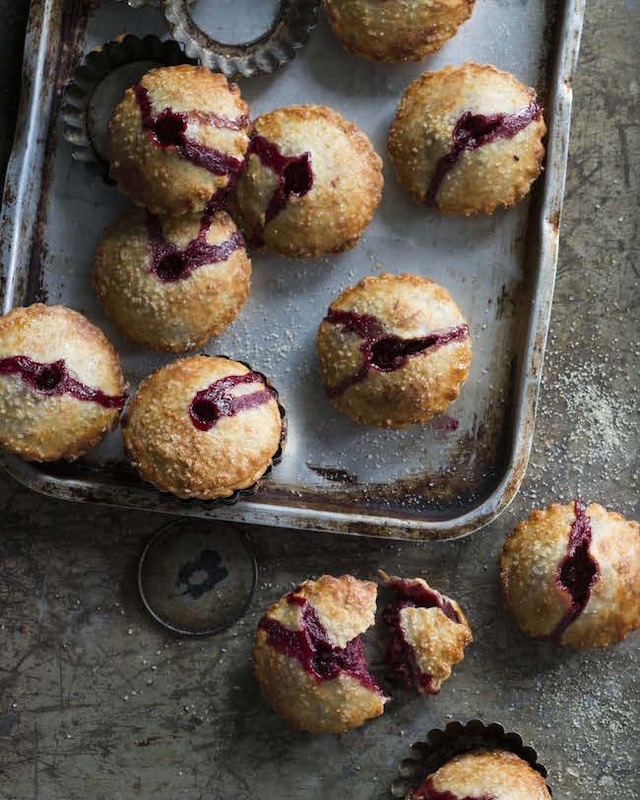 These mini apple pies are little bite-sized bits of Americana, with a Bourke Street Bakery rhubarb twist. We use granny smith apples, as their texture holds up well during baking, but you can experiment with other naturally sweeter apples if you like. The golden, buttery pie crust melts in your mouth when heated up and served with a scoop of ice cream. Follow the instructions on pages 135–136 to roll out the pastry and use it to line twelve 8 cm (31/4 inch) round, fluted loose-based tart tins. Cut out twelve circles with a 9 cm (31/2 inch) diameter to use as the lids. Rest the pastry cases and lids in the fridge for 20 minutes; these ones do not need to be blind-baked. To make the filling, combine the rhubarb, butter and sugar in a heavy-based saucepan over medium heat. Cook, stirring, for 8–10 minutes, or until the rhubarb has broken down completely and most of the liquid has evaporated. Add the apple and continue cooking for 5–6 minutes, or until the apple is slightly soft. Set aside to cool completely. Spoon 21/2 tablespoons of the fruit mixture into each pastry shell, piling it slightly higher than the top of the shell. To attach the lids, brush the rim of the pastry base and the lid with a little egg wash and lay the lid over the base. With your thumb and index finger, gently squeeze the top and bottom pastry edges together to make a good seal. Brush the pie tops with egg wash and make a small hole in the middle of each to allow steam to escape. Reduce the oven temperature to 180°C (350°F) and bake for 20–25 minutes, or until the pastry is deeply golden. Your baked pies will keep in an airtight container at room temperature for a day, or you can freeze the unbaked pies for up to 1 month. This pastry will have a slightly uneven edge around the rim of the tin, resulting in a tart that looks rustic and home-made, which is what we aim for at Bourke Street Bakery. If you are after a perfectly even effect, this is not the pastry to use — this dough has water in it, which means it will shrink as the water evaporates during baking; the following method is to help counteract this shrinkage. If you are looking for a perfect result, use the Sweet pastry (pâte sablée) recipe on page 137, but keep in mind that it is a far more fragile dough than this one. The number of tarts you end up with will vary, depending on how thinly the pastry is rolled. The pastry can be frozen for up to 2 months, so it makes sense to line all the shells with foil (ready to blind-bake), store them in the freezer, then blind-bake them as you need them. You do not need to thaw them first. Remove the butter from the refrigerator 20 minutes before you start mixing — the butter should be just soft, but still very cold, so it doesn’t melt through the pastry while mixing. Put the vinegar, sugar and water in a bowl, stirring well. Set aside for 10 minutes, then stir again to completely dissolve the sugar. If mixing the dough by hand, mix together the flour and salt in a large bowl and toss the butter through. Use your fingertips to rub the butter into the flour to partly combine. If using a food processor, put the flour and salt in the bowl of the food processor and add the butter, pulsing in one-second bursts about three or four times to partly combine. You should now have a floury mix through which you can see squashed pieces of butter. Turn the dough out onto a clean bench and gather together. Sprinkle with the sugar mixture and use the palm of your hand to ‘smear’ this mixture away from you across the bench (a pastry scraper is a useful tool here). Gather together again and repeat this smearing process twice more, before gathering the dough again. You may need to smear once or twice more to bring it together — you should still be able to see streaks of butter marbled through the pastry; this gives a slightly flaky texture to the final product. two round, flat discs, 2 cm (3/4 inch) thick. Wrap each disc in plastic wrap and chill for at least 2 hours, or overnight. Remove the pastry from the refrigerator 20 minutes before you wish to roll it. Sprinkle a little flour on the bench and rub a little flour over a rolling pin. Working from the centre of the pastry, gently roll the dough away from you, then turn the dough about 30 degrees and roll out again. Repeat this process until you have a flat round disc, about 3 mm (1/8 inch) thick. Sprinkle extra flour over the bench and rolling pin as needed, but use it as sparingly as possible — if too much flour is absorbed into the dough, the pastry will end up with poor flavour and texture. Bear in mind that you are trying to flatten the pastry into a disc, not ferociously stretch it out in all directions. Stretching will only cause the pastry to shrink excessively during baking. Transfer the pastry to a tray, cover with plastic wrap, and refrigerate for at least 2 hours to allow the gluten to relax. To make one 28 cm (111/4 inch) tart shell, roll out the pastry to 4 mm (3/16 inch) thick and cut it into a 30 cm (12 inch) disc. Knead the excess dough back together and roll it out again to get a few smaller discs to keep in the freezer. To make two 23 cm (9 inch) tart shells, roll out the pastry to 4 mm (3/16 inch) thick and cut it into a 25 cm (10 inch) disc. Knead the excess dough back together and roll it out again to get a second disc. (11/4 inches) deep, roll out the pastry to 3 mm (1/8 inch) thick. Cut into eight or nine 15 cm (6 inch) discs. Knead the excess dough back together and roll it out again to get the balance of the 12 discs. To make twenty 8 cm (31/4 inch) tart shells, roll out the pastry to 3 mm (1/8 inch) thick. Cut into twelve 11 cm (41/2 inch) discs. Knead the excess dough back together and roll it out again to get the balance of the 20 discs. At Bourke Street Bakery, we prefer to use loose-based tart tins and moulds, which have sides that are at an angle of about 90 degrees to the base. The right-angle offers more support than sloping sides and makes it easier to remove a fragile tart. Again, it is important not to stretch the dough when lining the tins. Place the pastry on top of the tart tin/s, ensuring it is in the centre, and use your fingers to gently push the pastry into the tin/s, moving around the rim until all the pastry has been inserted — you should now have about 1 cm (1/2 inch) of dough hanging over the sides. Use your index finger and thumb to work your way around the edge, forcing the pastry into the tin so that little or no pastry is left protruding. Where the upright edge of the pastry meets the base, there should be a sharp angle where it has been firmly forced into the corner — this method of lining the tin is to counteract the pastry shrinking once baked. Set the pastry cases aside to rest for at least 20 minutes in the freezer so that the gluten relaxes and holds its shape when you line it with foil. Once the tart has been lined and rested, most recipes will call for it to be blind-baked. Blind-baking pastry simply means you need to pre-bake the pastry before filling it, to ensure the base is crisp and cooked through. If you own a pizza stone this will work perfectly, as long as it is heated well and the pastry tin/s are placed directly on the stone. Preheat the oven to 200°C (400°F). Line the pastry with a double layer of foil, making sure the foil is pushed well into the corners. Pour in some baking beads or uncooked rice to fill the case. The blind-baking time will vary considerably from oven to oven, but the 8 cm (31/4 inch) and 10 cm (4 inch) tarts will take 20–25 minutes to blind-bake, and the larger tarts 30–35 minutes. When cooked properly, the pastry should be golden all over, particularly in the centre, which tends to be the last part to colour and become crisp. Once cooled, the tart shell/s are ready to be filled. Now that you’ve folded and rested the dough for your croissants, it’s time to shape them, bake them, and eat them! Once you’ve shaped your croissants, you can store some in the freezer for a few weeks. When you’re ready to use them, place them in the fridge overnight, then early next morning leave them somewhere warm and moist to prove for 2–3 hours, then bake as normal. Make the rested dough from the fridge and roll it out into a rectangle measuring about 25 x 100 cm (10 x 391/2 inches). This may take quite a lot of energy, as the dough may keep springing back to its original size. If this happens, rest the dough in the fridge for about 10 minutes, then resume rolling. This resting process may need to be done a number of times. If the dough is becoming too large to fit in the fridge, simply fold it over and place on a tray before chilling it. Cut the dough into 18 triangles, each with a base 9 cm (31/2 inches) wide, and two sides that are 21 cm (81/2 inches) high — you may wish to prepare a template by drawing the dimensions onto a piece of cardboard and cutting out a triangle to use as a guide. Place the triangles on baking trays lined with baking paper, cover with a clean tea towel and rest in the refrigerator for about 10 minutes. tip, to form a croissant shape. Press the tip on to secure it. Place the rolled croissants back onto the lined baking trays, at well-spaced intervals. Cover loosely with a damp tea towel or damp muslin (cheesecloth). Set aside in a warm room (about 26–28°C/79–82°F) for 2–3 hours, or until almost doubled in size. (It takes a little longer to prove croissants made from overnight dough, but you will end up with a better-flavoured croissant.) Spray the cloth with water occasionally if it becomes dry. Preheat the oven to 200°C (400°F). Put the egg wash ingredients in a bowl and whisk using a fork until combined. Lightly brush the top of each croissant with the egg wash and place in the oven. Turn the oven down to 180°C (350°F) and bake for about 15 minutes, or until deeply golden. Cool slightly on the trays before devouring. « Easy Chocolate Mousse Parfait Recipe – Celebrate the 12 Days of Christmas with Sweet’N Low®! Apple rhubarb–hm-please describe the taste as I do not appreciate rhubarb plain.